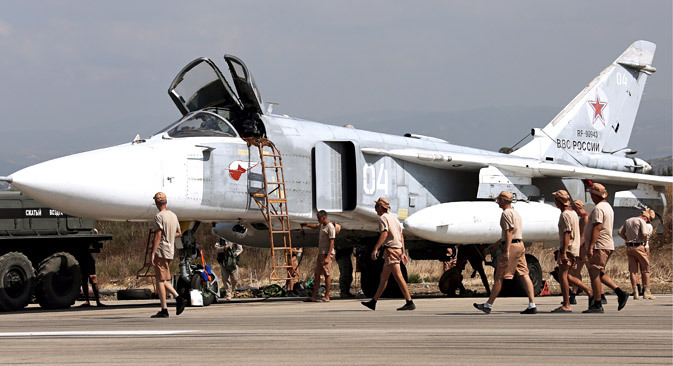 Russia's Sukhoi Su-24 attack aircraft at the Hmeymim airbase. The Russian Defense Ministry has confirmed the death of a Russian contract serviceman at the Hmeimim base in Syria as a result of suicide. "The contract serviceman stationed at the Hmeimim airbase as a technician committed suicide while he was resting after duty," a source in the ministry's press service and information department told Interfax. Circumstances of the tragedy are being looked into. "According to the preliminary information obtained, in particular, in the analysis of text messages in his phone, the reason for the death of the contract serviceman is problems in his personal relationship with a girl," the department representative said.